Home Ecommerce Platform Is F-Commerce "Fail" Commerce? The next day, Bloomberg published an article reminding us that big retailers like JC Penney, Gamestop, Nordstrom and GAP that have shut the doors on their F-stores. It’s no surprise that embedded stores have faltered. The shopping experience within Facebook is painful compared to regular websites. Who prefers the banner ads, smaller screens, slower page loads, reduced functionality of F-stores? Not to mention, Facebook’s stellar track record with member privacy! Simply plugging a catalog into a Fan page is not social commerce. It’s just commerce inside a social network. But Facebook users have not shunned commercial brands. Consumers will Fan / Like brands in social networks in order to “recommend” to friends and to give permission for the brand to interact with their News Feed. The new wave of Facebook Timeline Apps are all about creating experiences that are social and that people want to use personally and share across their network, leveraging the Facebook Open Graph. At the risk of sounding like an ecommerce consultant all-too-eager to hail the virtues of an unproven platform, let’s look at the social commerce opportunity beyond plug-in storefronts. If you recall, in the digital disruption webinar we did last week (it’s still free to check out), Forrester’s James McQuivey how businesses can become disruptors by finding the adjacent possible, or the intersection of the next most immediate thing that people really want,” and matching it to the next immediate thing that you can provide. 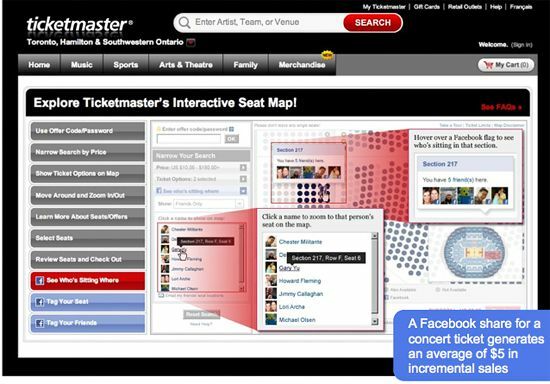 Ticketmaster’s Timeline app allows fans to share events they are attending with friends, order tickets through the app and receive event suggestions based on their likes and listening habits through Spotify. Its Interactive Seat Map allows people to see where their friends are sitting at an event. According to Ticketmaster, each share drives $5 in incremental revenue. F-stores don’t have to be catalogs. In fact, they should be anything but your full catalog. Electronic Arts launched a temporary “pop-up” store within its fan page for pre-orders fo Battlefield 3 along with exclusive gifts like Back to Karkland Expansion Pack, Physical Warfare Pack and Play4free Beret and Gun. Using Facebook as an alternative to a microsite increases the value of being a fan, and makes social sharing seamless. Offering exclusives is a way to reward die-hard fans and deepen the commitment between brand and customer. EA also created a “Missions” app, which extends the social aspect of the game. Users can build “squads” of their Facebook friends, create events or share videos. Box office movies are by nature social products – people attend movies with others and talk about them with friends, and now research and discuss them through social media. The old school way of marketing films was through theater trailers, TV spots and bus shelter posters. 20th Century Fox pulls a 21st century move by creating a Facebook page for it’s Ladies’ Night from which fans could purchase tickets and enter for a chance to win one of 100 copies of the book that inspired the movie. The studio also created an Event page to which fans could RSVP for the film, and incorporated a group-buy reward system in partnership with Gilt Groupe, SpaFinder and 7 For All Mankind. These experiences all make more sense within Facebook than on the brand’s website, leveraging the social graph and offering simple transaction selections rather than a copy of the entire catalog. “Brands have seen their website traffic increase 50% to 300% from Facebook in just a few months. This is dramatically more traffic than anything the industry has seen produced by social media up to this point. Certainly, the increased traffic adds immediate tangible value but there is a much bigger opportunity on the horizon. It’s not that F-Commerce is a failure, rather the shift is towards bringing social features from Facebook to your commercial website, rather than bringing your store into the social network. The reason why F-stores are a flop for most, if not all, ecommerce brands is customers were never asking for Facebook storefronts. If you can’t identify something that your customers want, that you can provide and add value to in Facebook, then don’t bother with the platform. Don’t jump on the bandwagon because bloggers, consultants and vendors hype it up. It’s OK to not do anything with Facebook. You may be in an industry where your customers just don’t evangelize your products, and it’s not worth building new experiences in social networks to boost your brand and customer loyalty. But to be a disruptor, you also have to be willing to try things that might fail. Focusing on “adjacent possibilities” allows you to test ideas, and fail faster and cheaper, and move on. And if you keep at it, you might just find a winner that transforms your customer relationships. Next article3D Printing: Digital Rights Management for Physical Goods?